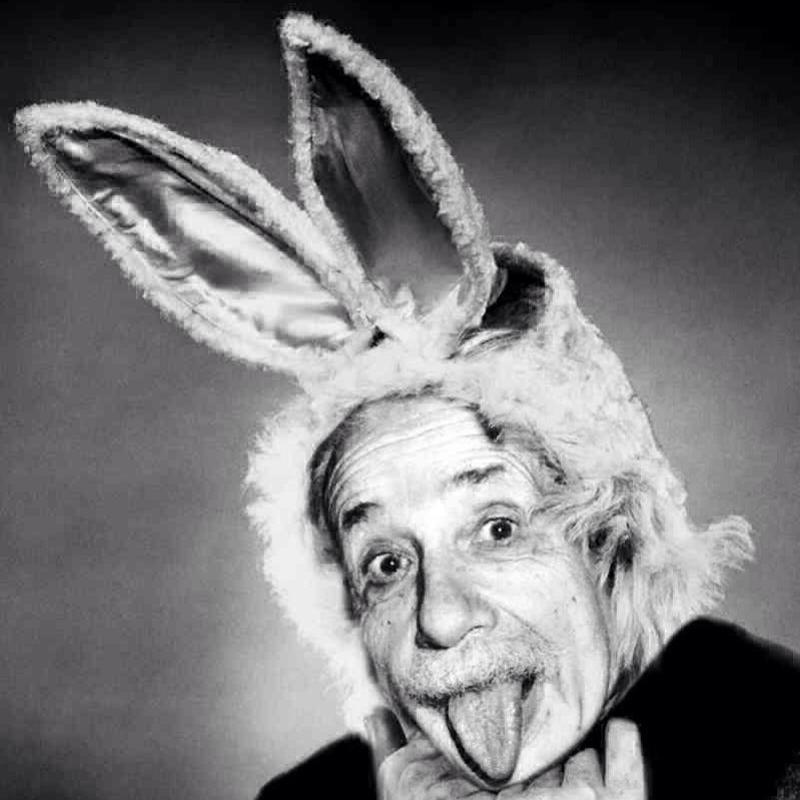 Even Einstein was smart about bunnies. Those of you who are on Facebook may be interested in a newly formed group, Rabbit Breeders Alert Network (R-BAN). The group was formed this past week with a goal of helping fellow rabbit breeders be aware of potential disease risks in an area for protecting their rabbits as well as legislative action alerts pertaining to our hobby and right to raise rabbits. Myxamatosis epidemic spreading in California. Coastal regions reported from Monterey to Sonoma Counties. Latest reports are inland to Fresno area. Myxamatosis is spread by insects such as mosquitoes and fleas, and is hosted in wild cottontail populations in CA and OR. Prevention is the best remedy: keep your rabbitry free of mosquitoes, fleas, any biting insects. Note that once infected rabbits are present the disease is also transmitted by hands and clothing. Symptoms for the disease range from sudden death within 2 days, to 12 days of virus incubation then rabbits eyes swell up and rabbit becomes lethargic, sometimes suffocating from secondary pneumonia. Cases in other countries reported to have some survival rate, the CA strain of virus does not have any reports of survival rate. Vaccine available in the UK but for some reason not here?? If purchasing rabbits from CA and OR it is recommended you quarantine them in a bug-free zone for two weeks. We are working on a new approach to isolate the causative agent and need some help. Our goal is to identify the agent, develop a diagnostic test to confirm disease and eventually a vaccine to prevent infection. We need samples of the mucous material that is the first sign of infection and we need it as soon as possible to do preliminary studies to validate our study hypothesis. We need samples from several herds in order to prove that this is the same organism in each outbreak. Time is critical, we are applying for a grant to fund a portion of this study and the deadline is only a few weeks away. It is very difficult to obtain funding for “rabbit health” issues. We need data from these samples to add validity to our proposal. We will not reveal the source of the samples to anyone and we will share anything we learn about this disease. Over the last 18 months I have spoken with dozens of rabbit breeders who are dealing with this infection in their herds and I am asking that anyone who currently has this disease please contact me as soon as possible if you are willing to send samples. Many times breeders aren’t aware that others are facing health issues in their rabbitries or what treatments have been successful or unsuccessful in combatting the issues. This forum is designed as a way to alert others about what may be spreading across various areas of the country and how to manage the issue. We’re in favor of anything that helps these animals stay healthy and productive! If you’re interested, head over to Facebook and join the Rabbit Breeders Alert Network (R-BAN). The government used to encourage citizens toward self-sufficiency. We’re big fans of self-sufficiency around here, as well as making a dollar stretch like a piece of taffy! 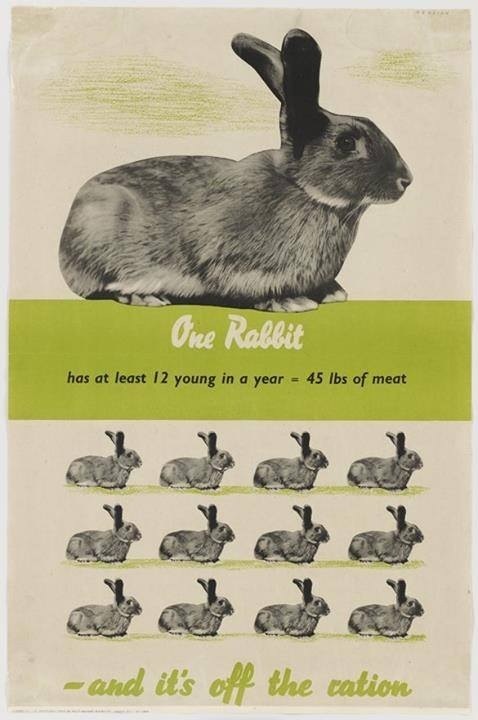 One of the main reasons we decided to raise rabbits involved the realization that not only is rabbit meat extremely healthy, low fat and high protein, we would never regularly purchase organic or all natural meat at the grocery store as it was cost prohibitive for our family. Raising rabbits has allowed us to feed our family a meat we know is healthy, antibiotic-free, and that has been raised and butchered humanely. Not to mention the carbon footprint of a rabbit is significantly smaller than beef, pork, or poultry for the same amount of consumable food! Rabbits as livestock even the playing field and give people an opportunity to actively participate in creating a healthy future for their families. Rabbits allow those who live in apartments, have limited income, or don’t have the time to invest in a labor-intensive product to successfully take part in owning their destiny. Developing countries around the world have recognized that rabbits are a way to meet a basic necessity — to eat — as well as work their way out of poverty. In our own country, where far too many people are eating fast food and slowly poisoning their bodies with preservatives, we believe raising rabbits is a viable way to break the cycle of food poverty and obesity! Rabbits take daily care, but are very low maintenance. While they need regular cleaning, they can also be raised discretely as they make hardly any noise at all. Rabbits have a quick turn around from birth to butcher – I like to joke that they are the impatient person’s perfect animal, as they mature and gestate very quickly in comparison to other livestock animals. Once upon a time our government encouraged citizens to plant Victory Gardens and raise their own livestock for food. Handouts were an option, but really encouraged only after people did their best to support themselves with the resources they had available to them at the time. I sure do wish we were receiving the same message today. This is the first summer, ever, that we’ve made any sort of an attempt to garden. Baby steps, friends, baby steps. We’re the ones who get excited when a houseplant lasts more than three months. 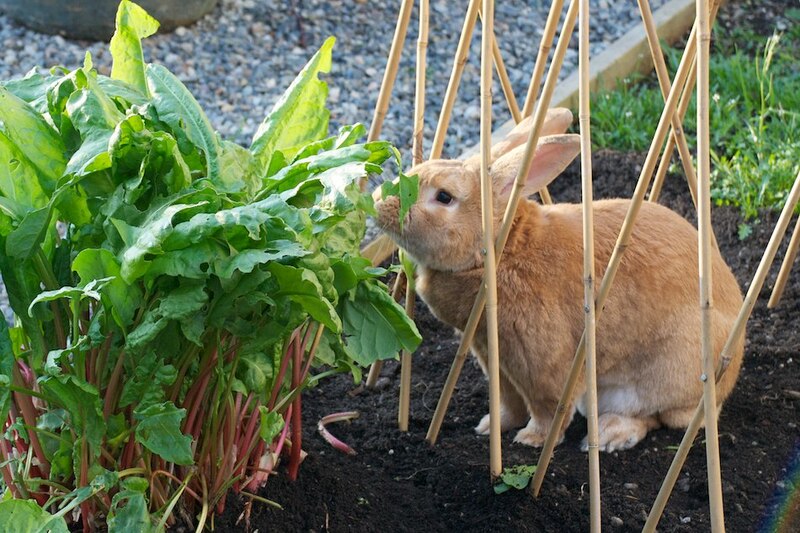 We have another consideration as we attempt to garden this year: the rabbit. We recently retired a fantastic Silver Fox mama, Eclipse. She’s been such a great rabbit for us that we don’t have the heart to move her along permanently — yet since we’re a small rabbitry we really need the cage space for animals that are earning their keep! We gave it a good deal of consideration, checked the fence line for security, and turned Eclipse loose in the backyard. We’re fortunate that we have a fairly large backyard totally enclosed by a secure 6′ privacy fence so this is a reasonable option for us to consider. So far Eclipse has put the miniature poodle in its place and the Great Dane seems a bit gun shy as well when faced with the 12 pound rabbit with an attitude! To recap, everyone’s getting along great and we now have our first official, pet-only rabbit. However, we don’t want Eclipse eating the fruits of our labors before we ever become real gardeners and taste the sweet taste of victory ourselves! So… what to plant?! Google, come, be our friend…. A quick search on the internet tells me that these plants offer no allure to a hungry rabbit. We’ll be planting some… I’ll let you know how the gardening goes at the end of the summer. Or, if she eats everything we’ve got down to the ground I’ll probably complain about it sooner! I also came across this lovely article on Controlling and Deterring Rabbits in the Garden. This website compiled a list of plants that rabbits DO like to eat. Plants with strong fragrance or fuzzy leaves, like lavender and black-eyed Susan, are less popular with rabbits. Interplanting herbs with your other flowers might make your garden less attractive. As silly as it may seem, sometimes rabbits don’t… breed like rabbits. But just this month we came across a totally new (to us) method – breeding by moonlight. Rabbits are lively at night! Just this month we got home late and remembered that we needed to breed a few rabbits in order to plan their due dates around some travel plans next month. So, even though it was fully dark, we decided to head out to the rabbitry and see if we could get some dirty business started. What a shock! Those girls were so ready it was as though their backsides were attached to rockets! We had such immediate success by moonlight fraternization we even attempted to breed a few of our most reluctant ladies — and they were quite happy to oblige! This was such a blatant change of pace that it’s another trick we’ll be adding to the options for what to do when your doe isn’t interested. 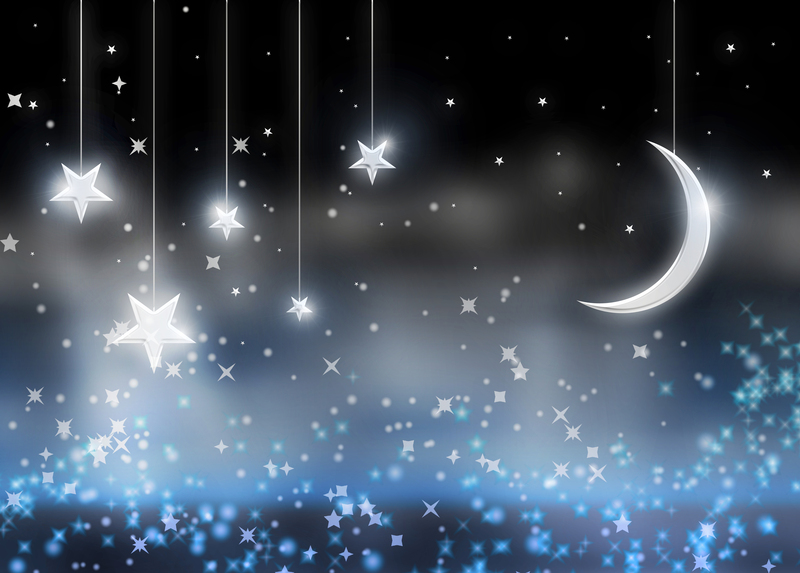 After all, everybody loves a little late night romance, right?! A few drops of blue food coloring per gallon of water has inhibited algae growth in our water bottles. Until we have an automatic watering system we will be best friends with our flip-lid water bottles. I love these bottles and especially the flip top lids – it takes so much less time than unscrewing the nozzle of each bottle to fill with water! One thing I DO NOT love about water bottles is that they can get “ew!”-stuff inside of them – algae, moths, dirt, etc. Earlier this year I complained about this at the feed store and one of the workers suggested putting blue food coloring in the water. She told me the blue coloring would inhibit the growth of mossy-type things in the water bottles. We tried putting 1-2 drops of blue food coloring per gallon of water for months and didn’t think much of it, it was under the category of “can’t hurt, might as well try.” We saw only minimal algae growth over the following months. When we ran out of blue food coloring we tried green for about a week – but that actually seemed to encourage growth in the bottles! When it was all said and done, space was at a premium I was being cheap. I didn’t want to buy all the other colors of food coloring from the box of four colors I could buy at the grocery and only use the blue, so we finally just gave up on it and for several weeks we haven’t put anything but our normal Apple Cider Vinegar in the water. 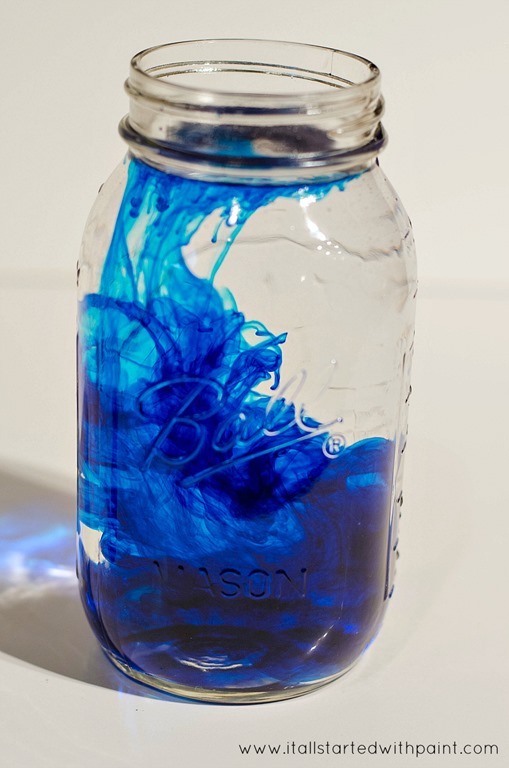 Last week after examining the cuts on my hands from scrubbing the bottles – yet again – I broke down and ordered blue food coloring off of Amazon. It arrived yesterday and I’ve been happily dripping the coloring in the water again. I have no scientific proof that this works, but from our real-life assessment, a few drops of blue could be what you need to fight the algae growth in your water bottles, too! Bunny Berries are excellent for repurposing in gardens. There’s no poop that works as well for the garden as rabbit poop. 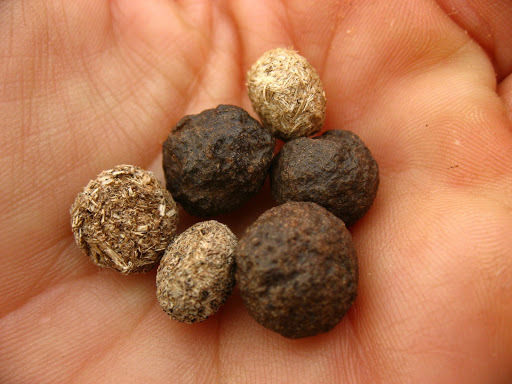 It has all the uber-benefits of horse and steer manure but with a distinct advantage: because it’s considered a “cold” manure, you don’t have to let rabbit poop age or compost before you use it. Other manures that come from chickens, sheep, horse, cows, and pigs or “hot” manures, need to be composted for months before you can safely use them or you’ll burn your plants to death. Not so with rabbit poop. Grab a handful and spread it all over the garden or fold it into the soil. It’s like time release capsules, as the pellets don’t completely break down right away. It’s slow-release thing. As they break down, they build your soil’s structure, improve the porosity, add stability, and hold nutrients for plants as well as other organisms in the soil. Another great way to take advantage of rabbit pellets and all their growing goodness is to make “bunny brew” or rabbit compost tea. Find a five gallon bucket, and a large scoop of rabbit pellets and drop them into the bucket. Give it a good stir every now and again for a day or two. Let the manure settle and use the tea at the top of the bucket to water your plants. You can dump the remaining manure at the bottom of the bucket onto your compost pile (no waste here). Of course, the proper English way would be to use a big piece of muslin or burlap and make a big tea bag and let it dangle into the bucket! If I gave you an earful on the virtues of rabbit poop in the garden, then you have to know that this goes double for the compost pile. With even a small pail of rabbit poop every once in a while, you’ll be in nitrogen heaven as far as composting goes. Bunny gold is nitrogen on steroids; it really gets a pile going. Thanks to The Vegetable Gardener and Rise and Shine Rabbitry for this insight! The challenge of living in our area during the winter include a wicked wind and occasionally several feet of snow. It’s Arizona, but it’s definitely not the desert in our mountain top town! This picture is of one of our hutches. 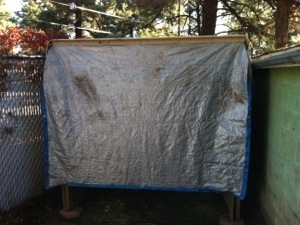 It’s enclosed on three sides, and has a simple tarp that can be dropped down to shield the rabbits against our high winds. Having the entire area fenced helps as well. Not only from the wind, but from any passing dogs or other animals who might be inclined to make trouble or consider our rabbits their dinner! We have been pleasantly surprised at the effectiveness of the tarp. The last several days, when the overnight temperatures have been in the teens, the water bottles have not been frozen (the metal spouts are another story, however…) Each morning we roll the tarp up and are greeted by sweet, furry, curious faces with wiggly noses! One additional thought, we pull the tarp up every single day to allow for as many sunlit hours as possible. Rabbits have a hard time breeding if they spend too much time in darkness (natural instincts take over). We will only keep the tarps down during the day if we have driving, wind swept rain that would end up soaking the rabbits or extremely cold temperatures (well below zero). How do you keep your rabbits warm?